"Sixty years ago, half of German war debts were cancelled to re-build its economy. Yet today, debt is destroying those creditors." explains Nick Dearden in his excellent Telegraph article about how today's corporate news self-servingly avoids the inconvient truth that Greece and Spain, among others, helped postwar Germany recover despite the slaughter of innocents during the Nazi occupation a few years before. Dearden goes on to explain, "The debt cancellation for Germany was swift...Germany was given large cancellation of 50% of its debt. The deal covered all debts, including those owed by the private sector and even individuals. " Adding, "... the most innovative feature of the London agreement was a clause that said West Germany should only pay for debts out of its trade surplus, and any repayments were limited to 3% of exports earnings every year." A deal Greece and the other indentured servants of Northern Europe's debt tyranny would gladly accept. 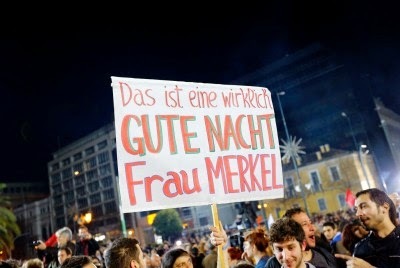 But, the Germans are adamant, Greece and the others must comply. Adamant, hollow and hypocritical too considering that "Germany’s 'economic miracle' (or wirtschaftswunder), which saw the defeated country rebuild its shattered infrastructure to become a world-beating industrial powerhouse, was made possible by that deal struck in London in 1953. In contrast to the 3% limit on German debt payments, the Greek government's crippling foreign debt payments are around 30% of exports. In reality, in '53 the elites feared communism more than they loved compound interest. Now, with their delusional heads firmly fixed up their own asses and believing that the lower classes have been subjugated the Bankers and Bilionaires Club refuse to remember their own history. The in the history of the world is chocked full of debt write-offs. From ancient Babylon to 1930s Europe, debt jubilees have been far more common than corporate media propaganda over Greece's modest proposals suggest. Modern capitalist propaganda that un-payable debt is always attributable to mis-management by the borrower, the reality is that lenders who make bad loans deserve to lose, whereas the modern elites game plan is to privatize profits and socialize losses, historic moral traditions rested on the principle that both creditors and debtors had equal responsibility for un-payable debt. The prognosticators are as confused as their muses. One group is convinced that Germany will have to yield in this dangerous game of chicken with Greece, others are sure yesterday's proposal by Greece of a debt swap for a different type of bond arrangement was in fact 'Syriza Blinking'. IMO, neither is true and neither is a acceptable. We all face the same enemy - The Bankers and Billionaire's Club. The actions of the club's Northern European branch is criminal and par for the course. Were the Greeks to accept the Trioka's yoke [with cosmetic changes] the outcome would be the same in the longrun as if Germany were to somehow come to its senses and change horses, the rich would keep getting richer on the backs of the people who work for a living leading to a larger plunge down the economic toilet as a result. Northern Europe's elites will not voluntarily give up their wealth and power. Syriza’s victory serves to reminds the anti-capitalist rabble everywhere that there is 'Another Way' to be in the world. A way where the tools of tyranny - money, debt and the delusion of democracy - defer to a new form of government: Dromocracy, from the Greek word "dromos," meaning the street.